Whisk together the Caesar dressing, lime zest and jalapenos in small bowl; set aside. Rinse any ice glaze from frozen Alaska Pollock under cold water; pat dry with paper towel. Heat a heavy nonstick skillet over medium-high heat. Brush both sides of fillets with oil. Place fillets in heated skillet and cook, uncovered, about 3 minutes, until browned. Shake pan occasionally to keep fish from sticking. Turn fillets over and season with chili powder. Cover pan tightly and reduce heat to medium. Cook an additional 2 minutes; adjust cook time for smaller fillets if necessary. (Reduce cook time by half for fresh or thawed fillets.) Cook just until fish is opaque throughout. Toss romaine with dressing. 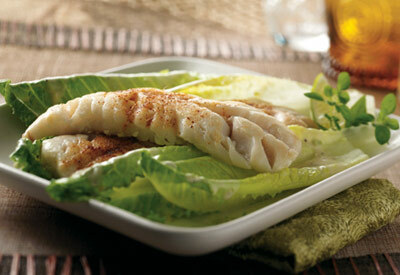 Portion 2 cups salad onto each of 4 plates; top with Alaska Pollock fillet.